Two years after the fall of the Fernando Lugo government and one year after the rise of Horacio Cartes of the Colorado party, social movements show signs of rebuilding, with remarkable leadership of the campesino movement facing agribusiness and repression. “How do you say ‘walking stick’ in Guaraní?” A smile is painted across an austere face, some 60 years old, with a thin beard and gentle and serene countenance. “Symbol,” he says, lifting a 50-centimeter cane, polished, on which the acronym FNC can be read. It’s similar to the one raised by almost all the campesinos and campesinas who form the procession in front of the Ministry of Hacienda, a half block from Asunción’s most centric street corner. “Symbol of struggle and power,” a female voice jumps in. The man smiles, nodding, looks at his symbol with care, and–like a mantra–repeats the word “power.” They reflect the self-esteem of a movement born under the dictatorship, [a movement] that did not stop fighting under any government, whether of the Colorado Party or Lugo’s progressive government, [a movement] taking the streets back from the Hugo Cartes government’s criminalization of social movements. Adela and Adelaida, six months and three years old from the Húber Duré settlement, died on July 21st, probably contaminated by agro-toxins. The settlement–330 kilometers from Asunción in the Canindeyú department– is inhabited by 260 FNC families that won five thousand hectares in 2000. They are coping with four deaths in their ranks, among them 22 year old Húber Duré. The death of children is one of the most terrible faces of the soy model implanted in Paraguay in recent years. But the model comes with two conditions that make it possible: repression and land concentration. The data says that Paraguay has ? ?40 million hectares of land, of which 24 million are arable. Nearly 8 million are tierras malhabidas, irregularly adjudicated by the state since 1954. Or rather, since the beginning of the Stroessner dictatorship. Paraguay is the most unequal country in Latin America. According to Dirección de Estadísticas y Censos, 1% of the landowners control 77% of productive land, and 40% of farmers own only 1% of the land. 9.7 million hectares are concentrated among just 351 landholders, while there are 300,000 landless campesinos. It is the country with the largest rural population in the region, but 53% live in poverty. A single landowner, Tranquilo Favero, has one million hectares dedicated to cattle and soybean production through Grupo Favero, with a network of ten companies linked to the production, storage, transport and export of grains, livestock and the agrochemical industry. Campesino movements demand the expropriation of part of these lands they consider to have been acquired irregularly. In addition to land concentration, a strong foreign ownership of land is noted. Nearly 8 million hectares, or 30% of arable land, are in foreign hands: nearly five million are owned by Brazilians and two million have been purchased by Uruguayans. They speculate on land prices: one hectare in the Paraguayan Chaco is worth $350 USD, while in Brazil one hectare ranges from $5,000 to 10,000 USD. Ten years ago, when the speculative surge began, the price was just $50 USD/hectare. To reach these levels of land concentration and foreign ownership, the [Paraguayan] state and landowners have unleashed a war against the campesinado. In the 25 years since the end of the Stroessner dictatorship, they got the rural population to fall by almost 50%. The Chokokue Report, 1989-2013 by the Human Rights Coordinator of Paraguay (Codehupy) reflects this reality. During the “Agribusiness in the Southern Cone, resistance and alternatives” seminar, organized by the Rosa Luxemburg Foundation, Serpaj Paraguay, and the Social Research Base (Base Investigaciones Sociales) in Asunción, a delegation visit to the Tacumbú prison was arranged. It was mostly women that went: women from Malvinas Argentinas (where, in a Córdoba neighborhood, they successfully stopped Monsanto), women seminar organizers, and women from Conamuri, along with people from Brazil, Argentina, and Uruguay. He, along with other campesino leaders (Basilian Cardozo, Gustavo Espínola, Arístides Vera, Simeón Bordón, Roque Rodríguez), took refuge in Argentina, from which they were extradited to Paraguay after two years and seven months in prison. In a deeply flawed trial–as recognized by several magistrates, such as the Lawyers Guild of Argentina (Asociación Gremial de Abogados de Argentina), Nobel Peace Laureate Adolfo Pérez Esquivel, and various judges–they were charged with the kidnapping and murder of a former president’s daughter. It was a way to criminalize and destroy social organizations. In the same Tacumbú prison in Asunción, we find Ruben Villalba, a survivor of the June 15, 2012 Curuguaty massacre, in which killed 11 campesinos and 6 police lost their lives. It led to the parliamentary coup that ousted President Fernando Lugo. Like the others, he was a campesino leader, wounded from a shot to the head and without medical attention despite his precarious health. In 25 years of democracy, 115 leaders and members of campesino organizations have been assassinated or disappeared. For Codehupy, it comes down to the implementation of a “systematic plan of executions” against campesinsos, “with the objection of forcing their displacement, in order to appropriate their territories” through “methods of state terrorism.” Two thirds of the murders (67%) were perpetrated by “vigilante gangs,” the rest by police and military. But there were two cases in which detainees were killed when they were under the custody of the fuerza pública. But most symptomatic–that which reveals the nature of justice and the Paraguayan State–is that all of the murders are unpunished, and the possibility of fair trials to reach the real culprits was obstructed. The map Codehupy distributes with the report reveals that the murders were committed right in the area of soybean crop expansion. It’s a coherent plan with “political finality” with two principal objectives: destroy the organization of excluded peoples, and release their land to agribusiness. The lesson is very hard, but being recognized by the movements: power proceeds to socially cleanse in order to lubricate the accumulation of wealth and power. March 26 was the first general strike against the Cartes government. Workers from seven union federations picketed the main entrances to Asunción to prevent vehicle entry, demanding a wage increase of 25% (contra the 10% offered by government with the repeal of the Public- Private Alliance that empowers the Executive to contract [private] companies for infrastructure works). 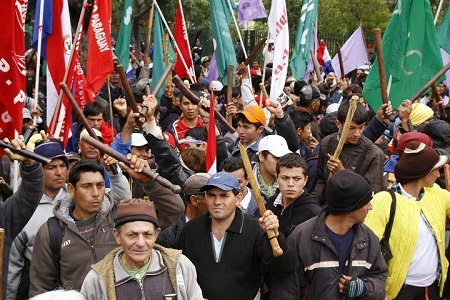 The strike coincided with the 21st annual Marcha Campesina, a mobilization for comprehensive agrarian reform in which 10,000 members of the FNC participated. As in other occasions, campesino presence was crucial to the success of the first strike in 18 years, with a previous week of protests across the country. The impression is that two years after the fall of the progressive Lugo government, movements are being revived, new actors–particularly urban actors–are appearing, and their actions tend to coalesce, as happened in mid-August. In them, however, however, you can catch a glimpse of changes related to what happened a decade ago, when united movements slowed privatizations in 2002. Some of the most active movements are those that remained independent during the Lugo government instead of embedding themselves in state institutions. That option has probably allowed them to have strengthened in recent years, as is such with the FNC and Conamuri. On this occasion, it would be necessary to know more about the case of the FNC (which became the largest peasant organization in Paraguay) through various testimonies and the book ?andekuéra. All of Us. In 1976, the dictatorship dismantled the Christian Agrarian Leagues (Ligas Agrarias Cristianas). By the 1980s the peasant movement was reorganizing. In 1986, the National Agricultural Producers Coordinator (CONAPA, Coordinadora Nacional de Productores Agrícolas) emerges, and after the fall of the dictatorship, the FNC is created in 1991. The organization is defined as “democratic, class-conscious, and combative.” It has eleven regional organizations integrated into a National Council of Delegates (which meets every four months) and the Central Directorate, whose authorities are based on direct elections. The FNC has won over some 200,000 hectares of land, on which just over 14,000 households–about 60 thousand people–are settled. Not all these lands were the result of organized taking; two other sources exist: old campesino settlements and spontaneous gains, that went to the FNC meetings in pursuit of knowledge and support. For this reason they differentiate between occupations, settlements, and communities. Occupations are seized lands whose ownership [the group] disputes with landowners and the state. They have not secured stability and are often persecuted. Settlements are colonies that are in the process of being legally recognized. Communities are lands adjudicated and recognized by the state long ago. The FNC only occupies properties over 3,000 hectares, their target being large estates. Currently they have 40 settlements. In general, settlements distribute some 10 hectares to each family, where they produce subsistence crops, and leave a part for community use. Internally, they are organized by committees of families plus one director elected by an assembly of two representatives per committee, two young people, and two women. There is usually a store, a school, and an infirmary in the center of each settlement. After three or four years, they produce enough to sustain themselves and have surplus to sell in the market. On May 17, they organized the second National Production Fair (Feria Naciones de Producción) in Asunción, where a lot of settlement products were sold: fresh cheese, chicken, and eggs, kidney beans, cassava, corn, pork, chipá, tomato, starch, honey, peanut, and horticultural products like lettuce, onions, parsley and pepper. Many were surprised by the variety and quantity of products. [The FNC] define themselves as autonomous and independent and believe “direct and organized participation through discussion, organization, struggle, and conquest constitute fundamental bases for elevating the political consciousness of the campesinado and the whole pueblo.” They don’t take part in elections and habitually promote blank ballots, rejecting institutional charges. 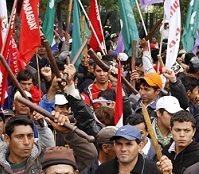 During the August 13-15 demonstrations, the FNC met with Conamuri, the OLT, the Paraguayan Campesino Movement, political organizations and unions. Teodolina Villalba, the first woman secretary general of the FNC, denounced the violence suffered by campesinos and the contamination caused by fumigation. 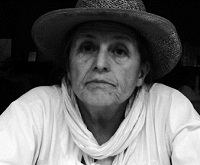 “Under the Cartes government, abuses of soy agribusiness have increased, and a process of campesinos handing over territories to corporations like Cargill and Monsanto has been triggered.” Perla álvarez from Conamuri welcomed the attendees of the festival by the Earth in the National Pantheon of Heroes in downtown Asunción, with which three days of protest were closed. She defended unity in action and food sovereignty, a central issue for poor women. María García from Norte Community Defense Coordinator was also there. Her home was flooded by the rising Paraguay River. In Ba?ado, the poorest place in Asunción, organized women rejected food that came with Colorado Party government tags in a remarkable gesture of dignity. A new leadership is gaining ground in the streets and in organizations. People from “below,” who have not done their learning in institutions, with a strong presence of women and youth. The next cycle of struggles for Paraguay promises to make new actors– the most excluded from popular sectors–visible, which will probably mark new directions and open up a new political culture.